Street demonstrations erupted in Iran once again on July 21 as thousands of people gathered in small pockets around central Tehran on the anniversary of an uprising in 1952 in which government security forces refused to fire on the crowds. This time, the Basij militia and members of the élite Revolutionary Guards were less kind, chasing protesters with batons, firing tear gas to disperse the crowds and, according to reports, arresting dozens in the process. 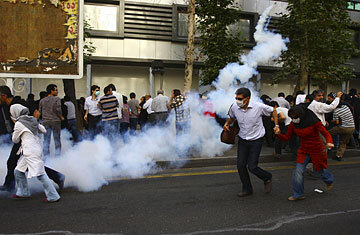 One source said that the underground Haft e-Tir subway station was teargassed. Two Revolutionary Guards were seen with bandaged noses around Haft e-Tir Square; the exact toll of the violence was not immediately clear. In retaliation, the government shut down mobile networks, and for perhaps the first time since the June 12 presidential election, the Internet was disconnected for several hours late Tuesday night. But protests appear to be coordinated and to be taking other forms apart from street action: on Tuesday, for example, thousands of disgruntled Tehranis tried to bring down the electrical grid at 9 p.m. by simultaneously turning on household appliances like irons, water heaters and toasters. Streets lights in the eastern suburb of Tehran Pars reportedly went off shortly after this, but electricity was not interrupted in central Tehran. A day after former President Mohammed Khatami called for a national referendum on the legitimacy of the current regime, demonstrators came out  albeit in smaller numbers  first at Haft e-Tir shortly before 5 p.m., and then spreading westward on Kharim Khan Street. Because of the overwhelming security presence  hundreds of Guards and undercover Basij were waiting at Haft e-Tir and other major squares  protesters adopted a relatively new strategy, eschewing their symbolic green to blend in with the after-work crowd, then suddenly chanting slogans like "Death to the dictators" before scattering and re-emerging down the street. Undercover Basij militiamen  many with slicked-back hair, wearing dress shirts and holding walkie-talkies  patrolled the main city arteries, in proportionally larger numbers than past protests. Although officially under the supervision of the Revolutionary Guards, they have in the past month become a fearsome force in quashing dissent. The reported killings of dozens of protesters last month has sufficiently intimidated many would-be protesters, as has Supreme Leader Ali Khamenei's continued threats of a "brutal" response to any public demonstrations. On July 20, he declared that "anybody who drives the society toward insecurity and disorder is a hated person in the view of the Iranian nation, whoever he is." One recent university graduate who lives near Haft e-Tir says he did not go to the protest because he knew security forces would be waiting there. "It's too dangerous," he says. Those who still go perhaps have less to lose; one man in his 30s, who earns roughly $300 a month working three jobs, has been to almost every protest thus far, with a bag of metal bearings in his pocket and a slingshot under his belt that he uses to target the Basij. "Yes, I'm risking my life," he admits. Meanwhile, Iranians are already looking to upcoming dates of significance to gather, in particular the 40th-day anniversary of Neda Agha-Soltan's death, which will occur at the end of July, and the inauguration of President Mahmoud Ahmadinejad for a second term. The date for the swearing-in has not been announced for fear of triggering a mass gathering on the scale of the Friday prayer last week, when former President Ali Akbar Hashemi Rafsanjani spoke for the first time since the election and condemned the government's response. Until then, protesters, even the more timid who choose to stay indoors, seem to be sticking to their tried-and-true form of dissent. At 10:30 p.m. on Tuesday, cries of "Death to the dictator" and "Allahu akbar" (God is great) were heard from rooftops across Tehran. See pictures of people protesting Iran's election around the world. See pictures of Ahmadinejad's supporters on LIFE.com.